"These are not your ordinary toys," said store owner Dolores Rose Dauenhauer. "These are handmade, smooth to touch, lovely to look at, and perfect for letting a child's imagination roam." SEATTLE, Wash., Feb. 10, 2015 (SEND2PRESS NEWSWIRE) — Seattle-based Georgian Wooden Toys is making its entire collection of beautiful handmade wooden toys available nationally via its new online store. The old-world style toys, made in the country of Georgia, on the Black Sea, are sold exclusively in North America by the Seattle company. How the Georgian-made heirloom toys got to Seattle is quite a tale. A friend of the owner, who visited Georgia, was so taken by the toys when she saw them in a small toy store that she met the group of artists who made them. 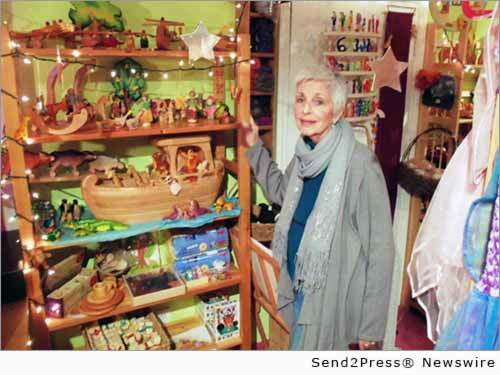 She convinced Dauenhauer to try to sell them in her Seattle book store; in 2000, the store commissioned one box of toys on trial. By 2001, Dauenhauer became the sole distributor of the toys in North America. The toys are also often purchased by collectors, and Dauenhauer expects that collectors will make up a good part of the online business. More information about Georgian Wooden Toys: http://georgianwoodentoys.com/. Original Keywords: seattle toy store Georgian Wood Toys Seattle Washington SEATTLE, Wash.
REFERENCES: Entertainment News, seattle toy store Georgian Wood Toys Seattle Washington SEATTLE, Wash.